Smug Scout is back from her winter vacation. Smug Scout slightly regrets that she has been so busy scouting in recent weeks that she has taken no time to write, but now that she is back at work, she can return to her writing duties. On Sunday she was feeling glum about being stuck in bright, sunny Los Angeles when she would rather be in grim, gray, dismal, rainy France, Germany, or Belgium, but a trip to the Mar Vista FM was helpful in distracting her from this preposterous longing. The market was offering greens at virtually every stand, so she of course bought assorted varieties of kale and chard as well as some fascinating skinny-leafed speckled lettuce that was almost the subject of this post. 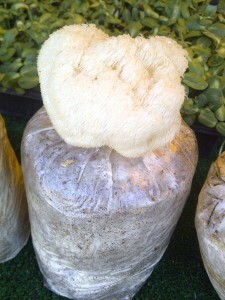 However, when she saw the sign for lion’s mane mushrooms (along with its name in Latin, surely a necessary reference for all the customers who may otherwise only know it as Japanese yamabushitake or pom pom blanc), she knew she had found her winner. Smug Scout was attracted by the sign’s promise: “rare – delicious – nutricious [sic].” Now we already know that all mushrooms are delicious and nutritious, and it seems like this one delivers on both counts: it can taste like lobster, it is 20% protein, and it has been proven to reduce anxiety, improve memory, and even regenerate dead or dying nerves (or something like that, but you are not reading Smug Scout for scientific accuracy). So that is all fascinating, but what makes this mushroom so Smug is the fact that it is rare and thus unknown to most people, even other mushroom cognoscenti. It also seems like it will stay that way because not many people are even able to buy these mushrooms from Tanya the backyard farmer from Thailand (previously introduced in “Smug Farmers’ Market Find: 10/7”). In fact, when Smug Scout says “not many people,” she means “one.” Yes, Tanya showed up to the FM with a table full of oyster mushrooms and one single lion’s mane. She offered to sell this solitary specimen to Smug Scout. As Smug Scout was photographing her prized bounty, she found herself mixed up in an unfriendly exchange with a disgruntled rare mushroom seeker. Disgruntled Rare Mushroom Seeker [to Tanya]: Wow! 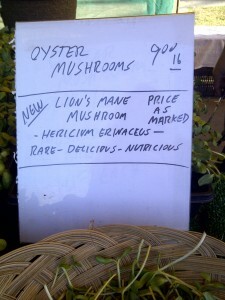 You have lion’s mane mushrooms! Smug Scout: I got it. Disgruntled Rare Mushroom Seeker [to Tanya]: But the market just opened five minutes ago! And what does she mean by “it”? Smug Scout: …and I just bought it. Disgruntled Rare Mushroom Seeker [still to Tanya]: That’s outrageous you came to the market with only one single mushroom to sell! Smug Scout: I guess you need to get here earlier next week. At this point Smug Scout received a look of death from Disgruntled Rare Mushroom Seeker, who then stormed off fiercely. Tanya was unfazed by the outright hostility (Smug Scout believes some of that was lost in translation, the rest in indifference) and actually went on to tell Smug Scout that she took Smug Scout’s recommendation to roast oyster mushrooms with olive oil and grilling spices and was so delighted by their uncanny bacon flavor that she stopped buying bacon altogether and has even asked for permission from the FM manager to bring samples for customers so she and her non-Thai husband can market the oyster mushrooms as a bacon substitute. All because of Smug Scout! Yes, Smug Scout is shamelessly proud of her influence here, especially because she advocates for pigs, who would certainly also support this new marketing of oyster mushrooms. The mushroom duel at the farmers’ market would make for a wonderful short film. We make regular mushroom-hunting forays into the forests of Brandenburg, but our doubts about our mushroom-identification abilities have thus far prevented us from harvesting even a single fungus. We’ve probably been tripping over lion’s mane mushrooms without even knowing it. Ewan, Smug Scout likes the idea of a short film and would be happy to play herself. She suggests you start working on financing. Lori, Smug Scout is sorry to hear about this very grim situation. She is horrified to think of all the lion’s mane mushrooms getting crushed by unwitting boots. Still, she understands that you do not want to die from eating a toxic mushroom. That is not how you want a rare mushroom hunt to end.